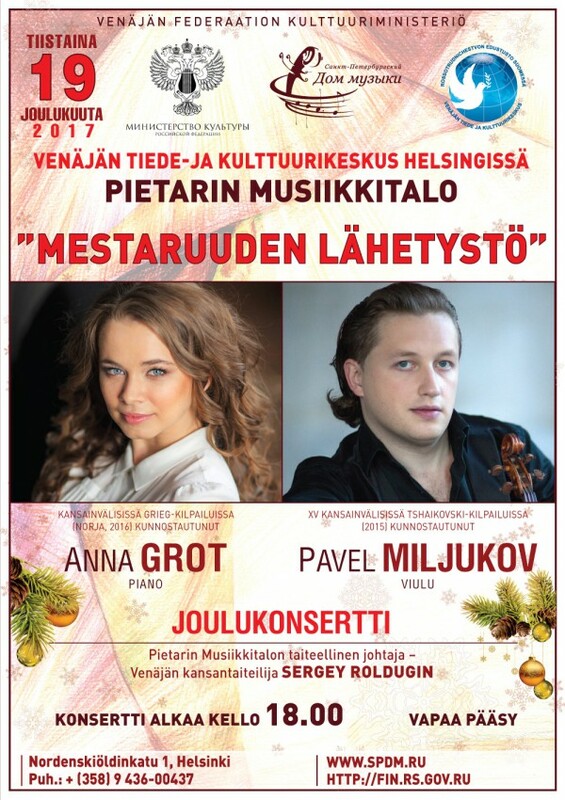 19 December, Tuesday, the capital of Finland is waiting for musical gift from St. Petersburg Music House and Rossotrudnichestvo – Christmas concert of the "Embassy of Musical Mastery". That evening Pavel Milyukov (violin) and Anna Grot (piano) will perform at the Russian Center for Science and Culture in Helsinki. The audience is waiting for evening of exquisite variations and sonatas. They will listen piano Mozart`s Variations on a Minuet by Jean-Pierre Duporte and Beethoven's 32 Variations with traditional heroism and rich figurative content. Beethoven's genius will be also revealed by Third Violin Sonata, dedicated to the composer's mentor Antonio Salieri. Prokofiev's Second Violin Sonata will contunue the story about genre. Essentially, this monumental piece became transcription for flute sonata, made at the suggestion of David Oistrakh. Special mood will be given by virtuoso Bartok`s piano series Out of Doors from five plays, wherein the piano is endowed with unusual percussive sound. Anna Grot, 27 years old. Postgraduate student of Moscow Conservatory (Class of the People's Artist of Russia, Professor Mikhail Voskresensky). The laureate of International Pianists Competition (Kazakhstan, 2015). Winner of Grieg International Competition (Norway, 2016). The Member of Music House Programs since 2014. Pavel Milyukov, 33 years old. Graduate of Moscow Conservatory (Class of the People's Artist of Russia, Professor Vladimir Ivanov). Student of Vienna Conservatory (Class of Professor Boris Kushnir). The Laureate of International Tchaikovsky Competition (Moscow, 2015). The Soloist of Moscow Philharmonic. The Member of Music House Programs since 2007. Helsinki, Nordenskiöldinkatu 1, 00250. Tel. : + (358) 9 436-00437.